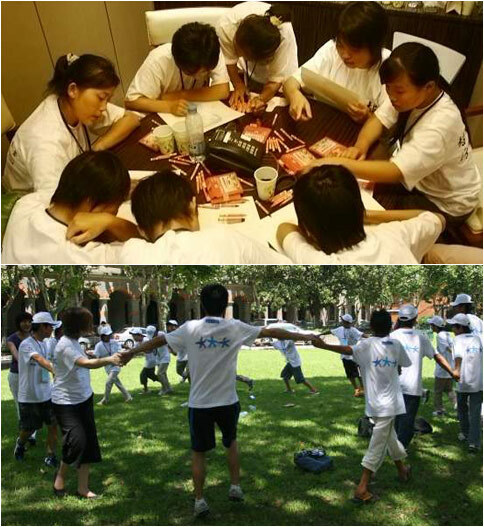 "All the children who are either HIV positive, or orphans of parents who died of AIDS from Henan or Anui Province are being brought to Shanghai for a series of summer camps. I just spent time with some of them, including a farewell dinner before the first group went back to their homes in Central China. They were all amazing, laughing, smiling, with a positive energy and such enthusiasm for all the new things they were being exposed to. Who could even tell how impacted their lives had been with such sadness. All these children have nothing to look forward to going back to their homes, but at least they went back happy, with big smiles on their little faces after a week in Shanghai, filled with fun going to the circus, music, art workshops, visiting the University and having lunch with all the students on the campus, visiting a bank, even getting a hairdressing lesson and much more! – a week that they will never forget! I know this week will give them hope for their future and inspire them to be brave, strong and to have the courage and the will to study hard and never give up! " .....This is what we are donating the money to! The summer camps.